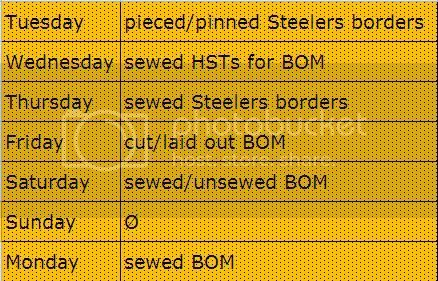 Thanks to the 15 Minute Challenge, I got the borders on the Steelers Quilt painlessly! If I had tackled it in one day, it would have been more than an hour and very frustrating with all those HST seams. Bit by bit worked much better. I also pieced my Saturday Sampler block from August during the first fifteen minutes of my sewing day. I still had some seam ripping, but it didn't seem as painful because I could catch my mistakes sooner when I checked it after fifteen minutes. Well, most of my mistakes. 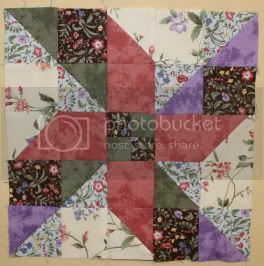 The bottom is correct, with the green and purple HSTs alternating. The top, where they don't, is wrong. Argh! So I have some more picking to do. See how others are managing their time at Life in Pieces and check out more BOMs at What A Hoot!